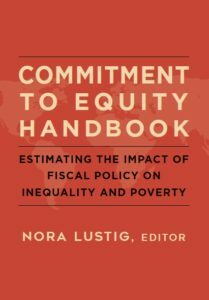 Access the NEW Commitment to Equity Handbook Estimating the Impact of Fiscal Policy on Inequality and Poverty for free online or order a hardcopy. The Commitment to Equity (CEQ) Institute works to reduce inequality and poverty through comprehensive and rigorous tax and benefit incidence analysis, and active engagement with the policy community. Click here for a primer. For Publications, follow the usual citation procedure. For the Indicators, follow the directions in the \”Cite As\” sheet. For power point presentations under Events, cite the references as specified on the presentations. Requests to translate and/or to publish materials from the CEQ website should be addressed to ceqpermissions@tulane.edu. Please include your name and contact information plus information about the requested use. CEQ typically requires credit and citation and reciprocal permission to re-post any translations of materials. Permission to reproduce CEQ materials may be denied at the discretion of CEQ Director.